16.02.2011 » Van Basten: "Cristiano Ronaldo is more fantastic than I was"
Marco Van Basten granted an interview where he considers Cristiano Ronaldo as a more spectacular player than what he was in the 90's, on his prime. The Dutch legendary player, Marco Van Basten, granted an interview to "France Football" magazine and praised Cristiano Ronaldo and Lionel Messi. Having been one of the greatest forwards in football history, that certainly entitles him the credit to comment about the stars of the moment. Van Basten: "Messi is fantastic, he's on a different world, but Cristiano Ronaldo is a more spectacular player than I was in the past. But there's also an interesting player if we take into account the way he's been developping: Zlatan Ibrahimovic. I believe his time in Barcelona changed him and now he's more active in the game and contributes more to team plays." However, even though Van Basten considered Cristiano Ronaldo more fantastic than what himself was in his prime, the Dutch still acclaimed the current Barcelona's team, leaded by Guardiola. Van Basten considers we are in presence of the best football team in history. 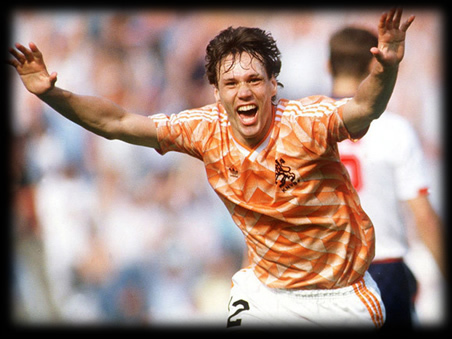 Van Basten: "Barcelona are like the Harlem Globetrotters. After we watch a game from them, all others look insipid or colorless. They play 70% of the game time in the opposite field. They are the best team of all time. No one has reached a similar level. Not even Ajax from the 70's, or AC Milan from the 80's and 90's".